Oil and gas are crucial to the Indonesian economic growth, of which the resources lie onshore and offshore that spread widely throughout the archipelago. The industry was established a long time ago, and the exploration has, until recently, been heavily concentrated in the Western part of the country. The oil and gas resources potentials are accumulated in 60 sedimentary basins, which are located all over Indonesia. Out of the 60 sedimentary basins, only 38 basins have been explored. The producing basins are 15, of which 11 basins are located in Western Indonesia Region, and the other 4 are located in Eastern Indonesia Region. Eight basins have had hydrocarbon discovery but are not yet producing, and the remaining 15 basins have been drilled but have not resulted in any discovery. These 15 basins are located in complex geological conditions or in Eastern Indonesia Region, while the rest of the basins are considered to be frontier basins and have not been explored. Physiographically, the Indonesia archipelago can be divided into Western and Easter regions which are separated by 200 m isobath starting from offshore Kalimantan in the Makassar strait to offshore Bali in the Lombok strait. Western Indonesia covers the island of Sumatra, Java, Kalimantan with smaller islands in between. This region is often referred as the main part of Sunda Shelf. Prolific Tertiary hydrocarbon basins in this area are principally confined to the perimeter of the continental margins in the Sunda Shelf. Eastern Indonesia covers the principal islands of Sulawesi, Maluku and Irian Jaya, and Arafura, Banda and Timor Seas, which lie on the Sahul Shelf, stretching northwards to the Australia continent. 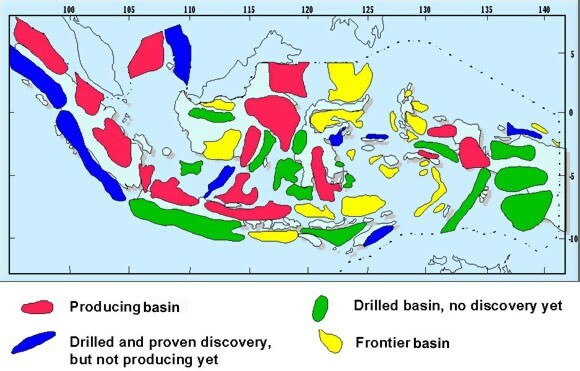 At present oil and gas discoveries in Eastern Indonesia are from both Tertiary and Pre-Tertiary reservoir rocks. Sedimentary basins in Western Indonesia are mostly located in onshore or in shallow water and are relatively large. On the other hand, sedimentary basins in Eastern Indonesia are mainly located in deep water and are relatively smaller than in the Western Indonesia. Roughly 30% of the offshore basins in Western Indonesia and 80% in Eastern Indonesia are classified as deep-sea basins. Many of the prolific Tertiary basins in Sumatra, Java and Kalimantan can be classified as mature stages in the exploration whereas production of their fields is declining. On the contrary, most of sedimentary basins in Eastern Indonesia are poorly explored. These under explored basins are located in remote areas, in deep waters or other geologically complex regions. Eastern Indonesia, at present, can be considered as frontier area. do not imply official endorsement or acceptance by CCOP."